Don't rush through the meal and savor every bite. Thanksgiving is a time of turkey, mashed potatoes, casseroles, pies, oh, and friends, family and giving thanks. Our anticipation of and obsession with food can seem at times like it's the focus of the holiday. "Thanksgiving is a holiday with so much emotion around food attached," said Dr. Alexis Conason, a clinical psychologist and the founder of The Anti-Diet Plan. "It's like there is this expectation to overeat on this day." (STOCK/Getty Images) This stock photo depicts a family enjoying a Thanksgiving meal. "Then the dam is let loose, and we often eat in ways that feel out of control or don't feel good in our body," she said. Taking a few simple steps to be mindful before, during and after the Thanksgiving meal can help with not just enjoying the meal, but enjoying the holiday too, Conason said. Suzy Amis Cameron wrote "OMD," a book about changing the world through food. From an angry political divide to domestic terrorism, times are stressful. "If we're stuck in conflict, feeling like, 'Oh my gosh, I shouldn't eat any pie. I'm on a diet but the pie looks so good. I shouldn't have it, but maybe I'll have a small piece,' that's a tremendous amount of energy that's going into the pie," she said. "That's energy that is not going into catching up with friends and family or taking in the sights or anything else going on." Mindful eating is the "antidote to dieting," according to Dr. Susan Albers, a psychologist at the Cleveland Clinic and The New York Times' bestselling author of seven books on mindful eating. "It's about eating the foods you love but in a mindful way, your awareness of hunger cues, your awareness of taste," Albers told "GMA" earlier this year. "When you tune into these cues, you enjoy food more and you're more in control of your eating." 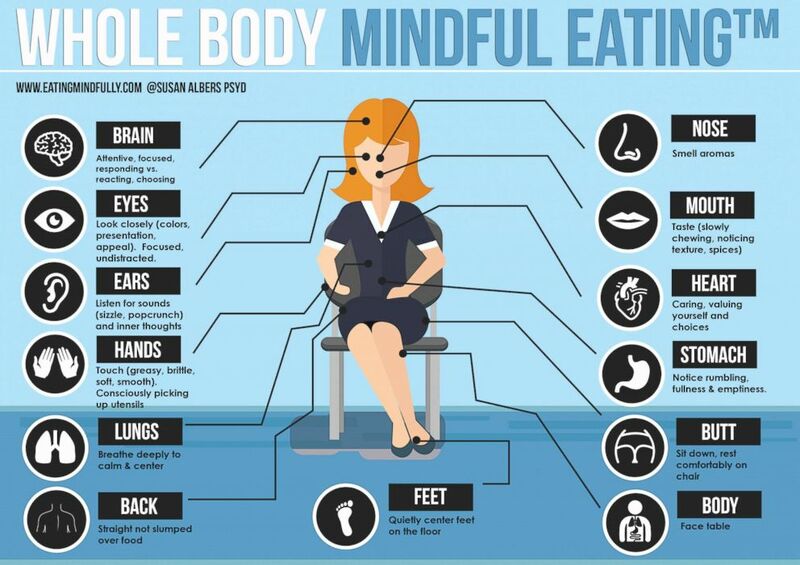 Mindful eating can be done anywhere and with any meal. You are eating mindfully if you are focusing fully on the food you are eating and are aware and accepting of your thoughts, according to Albers. (Susan Albers/Eatingmindfully.com) An infographic created by Dr. Susan Albers shows tips for eating mindfully. When it comes to Thanksgiving, a key part of being mindful is remembering that foods like pumpkin pie and sweet potato casserole are available year-round. "The idea that these foods are unique and special to Thanksgiving leads to a panic feeling of eating everything you can in this one opportunity," Conason said. "We can have pumpkin pie in July. Try to take away the idea of scarcity of the food or of restriction." 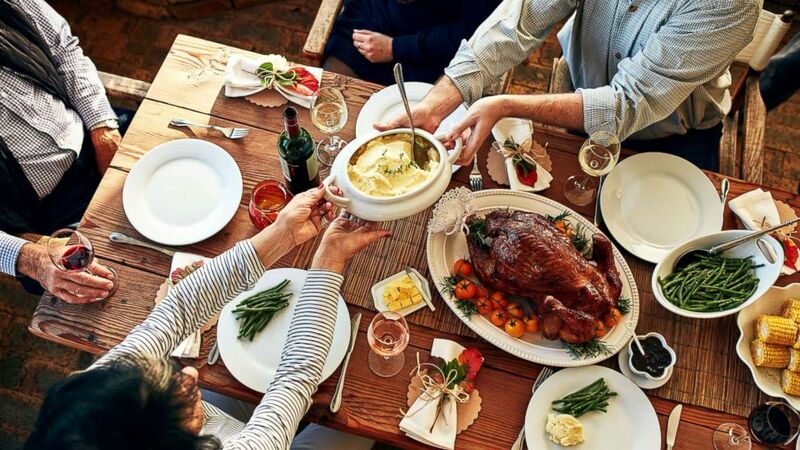 Conason shared these five steps to try on Thanksgiving Day so you can savor every bite and not overindulge. 1. Check in with your body: See how hungry you feel and if there are any particular foods you're in the mood for. 2. Look at the food options: Observe all the different foods available and think about how hungry you feel, what foods are most appealing to you and how you want to feel afterward. 3: Take a moment before you eat: Look at the food and maybe bring it up to your nose and smell it. 4. Pay attention: When you do eat, make sure you're smelling, tasting and looking at the food and staying in touch and being present as you're eating. 5. Check in again with yourself: As you're eating, see if your desire changed at all, if your hunger changed and pay attention to that process. "It's completely normal and OK to overeat sometimes," said Conason. "If you do overeat at Thanksgiving and feel uncomfortable, the best thing you can do is try to treat yourself with kindness and compassion and not beat up on yourself about it."